ADOM :: What’s your vocation? 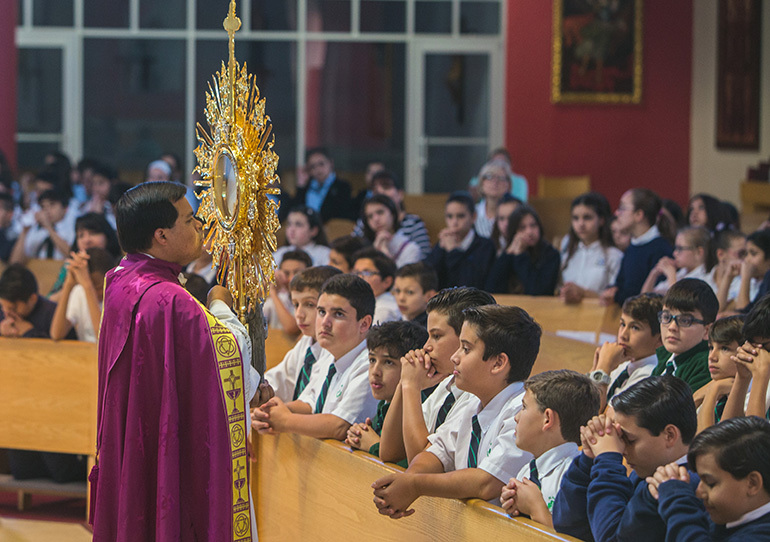 Father Elviz Gonzalez displays the monstrance to sixth graders during exposition of the Blessed Sacrament at the Focus 11 vocations rally March 1 at St. Agatha Church, Miami. MIAMI | Growing up, Father Elvis Gonzalez used to tell people that he wanted to be a doctor, fearful of his calling to priesthood. But when he moved to Miami at age 14, he always remembered the commitment and love of his parish priest growing up in Nicaragua. Samuel Garcia, 12, a St. Michael sixth grader, asks a question as Vocations Director Father Elivis Gonzalez looks on during the Focus 11 vocations rally March 1 at St. Agatha Church, Miami. 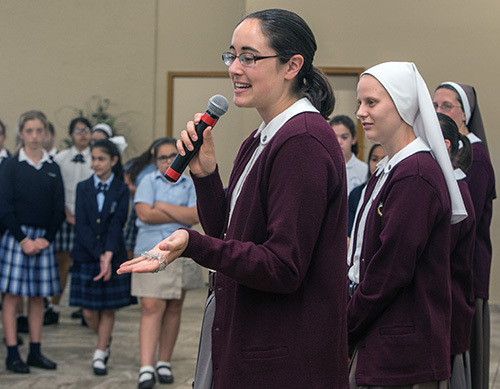 Karolyn Shewchuk, a postulant with the Servants of the Pierced Hearts of Jesus and Mary, speaks to sixth grade girls about being a postulant, novice and then sister during the Focus 11 vocations rally March 1 at St. Agatha Church, Miami. 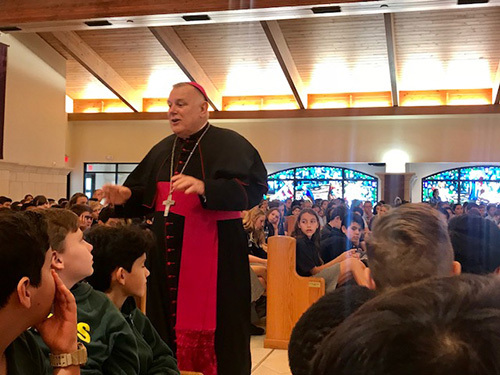 Archbishop Thomas Wenski speaks to sixth graders gathered at St. Gregory Church, Plantation, for the first of three Focus 11 vocations rallies Feb. 27. 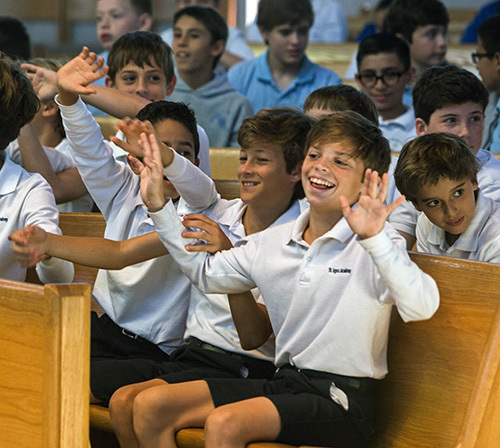 St. Agnes School sixth graders gyrate and sing "Yes, Lord, Yes, Lord, Yes, yes Lord," to the song, "Trading My Sorrows," during the Focus 11 vocations rally March 1 at St. Agatha Church, Miami. 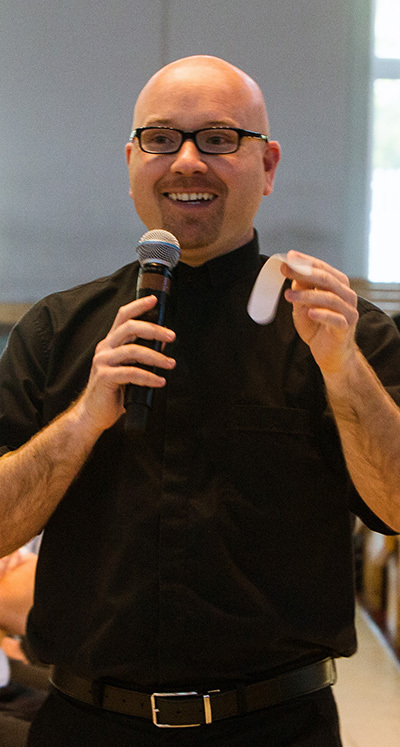 March 1, 2018 MARLENE QUARONI | FC Father Luis Pavon, parochial vicar at Our Lady of Guadalupe Church, Doral, explains why priests wear a white collar during the Focus 11 vocations rally that took place March 1 at St. Agatha Church, Miami. He said businessmen wear a tie, priests wear a collar. 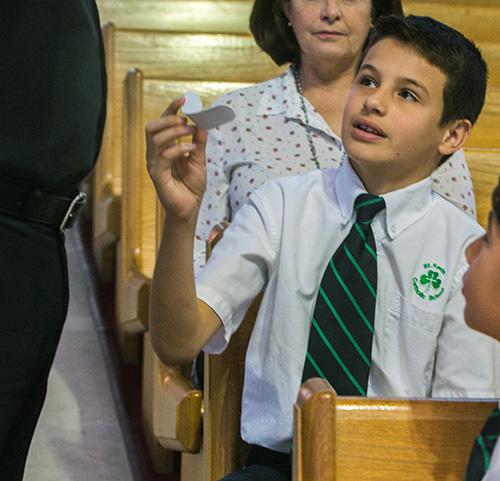 St. Kevin School sixth grader Tristan Trimino, 12, holds Father Luis Pavon's collar during the Focus 11 vocations rally March 1 at St. Agatha Church, Miami. 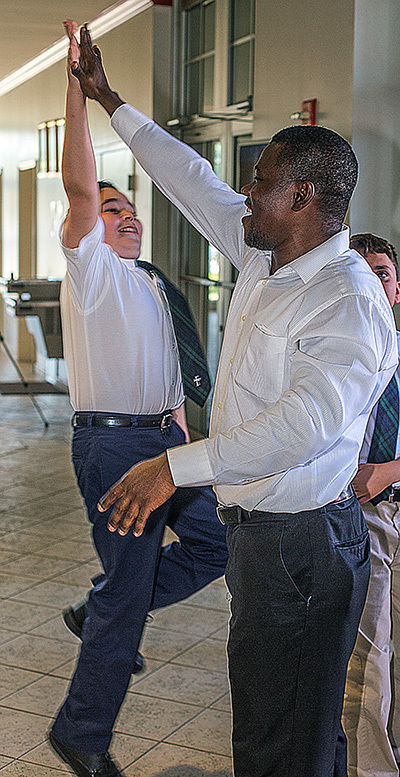 Seminarian Reynold Brevil high-fives Immaculate Conception sixth grader Matthew Medina, 12, as he and other sixth graders exit St. Agatha Church after the Focus 11 vocations rally March 1. “There was one lady who told me, ‘You know Elvis, the right way to ask about your life and your future is not so much what you want to become but asking the Lord, ‘What do you want me to be?’ So this time it was not about me, it was about the Lord. ‘What do you want for my life?’” the priest told over 500 attentive Catholic school students March 1. Father Gonzalez spoke to a combined total of over 2,200 sixth graders from Catholic schools across Miami Dade and Broward counties at three Focus 11 vocations rallies. Archbishop Thomas Wenski participated in the Feb. 27 rally hosted by St. Gregory Church, Plantation. The Feb. 28 and March 1 rallies were hosted by St. Agatha Church, Miami. Servants of the Pierced Hearts of Jesus and Mary and three archdiocesan seminarians assisted at the rallies. The annual program is called Focus 11 because psychologists have determined that children start considering career interests at age 11 and grade 11. A program for 11th graders will be held for the first time this October. Father Gonzalez affirmed that some are called to become mothers or fathers, teachers or policemen, all beautiful vocations. But maybe others want to be like their pastor or religious. And the way to hear the answer is by cultivating a friendship with Jesus through prayer, he said, challenging them to thank God each morning as they arise and to kneel at bedtime to listen and talk to him about daily life. They also must pay attention and be attentive. Are they good listeners or speakers, or do they always help classmates with homework? Do other people tell them they seem like they’d make a good priest? After lunch, girls learned about religious life from the Servants of the Pierced Hearts, an order founded in Miami 27 years ago. Sister Maria Jose Socias explained that all communities have three vows of poverty, chastity and obedience but theirs has a fourth of Marian availability. “We are called to be the presence and the image of the heart of Mary,” she said. She explained that religious dedicate themselves in a covenant of love to live for others as spiritual mothers. Other sisters described how they each felt a tug on their hearts towards consecrated life as they met religious in campus ministry at Illinois State University. They prayed, read Scripture and grew in friendship with Jesus in gradual steps of discernment. One shared how she felt a sense of peace and freedom when she broke up with her boyfriend. Sister Brooke Happ, of the Servants of the Pierced Hearts of Jesus and Mary, speaks into the microphone as Sister MacKenzie Gallagher displays her white veil, meaning that she is a novice in the community. 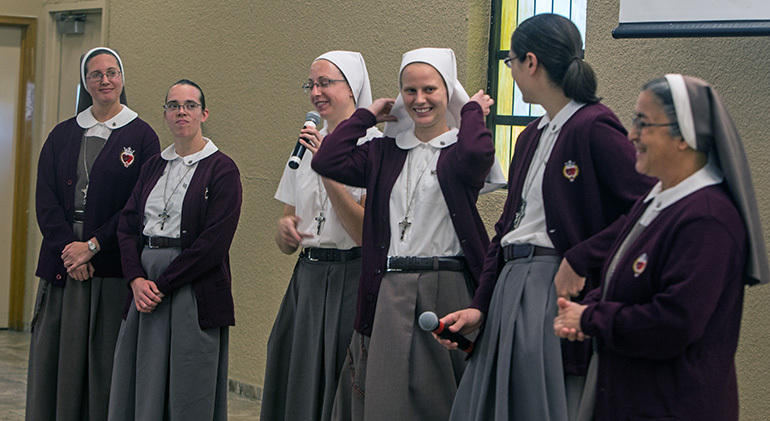 Brown veils are for professed sisters and postulants wear ponytails, the sisters explained during the Focus 11 vocations rally that took place March 1 at St. Agatha Church, Miami.